Both of Australia’s major supermarket chains, Coles and Woolworths, have slashed prices on their own-brand milk offerings, in a move which they claim will not affect farmgate prices for their milk suppliers, but which has nevertheless caused consternation throughout the dairy industry. Coles led the move when it reduced the price of a 2 litre bottle of own-brand milk by 47c to just $2 – which was immediately matched by its competitor, Woolworth’s – in a ‘loss leader’ move aimed at reeling shoppers in from other supermarkets, such as Aldi and IGA. Coles said that the cost of reducing its milk prices would be absorbed by the business, and formed part of the company’s “Down Down” campaign to reduce prices on staple items. Woolworths said that they would also be absorbing the cost of the price drop, but couldn’t say how long the situation would last. “This wasn’t a move we particularly wanted to take, but we have to react to our competitors,” said a Woolworths spokesperson. The Australian dairy industry has reacted with extreme concern, particularly at the possibility that the big two will begin passing the cost of the price drop on to farmers once the own-label products are established. “We are now facing the bleak prospect of retail milk prices reaching a point that is unsustainable for the milk value chain. This will flow back through the processing sector and ultimately to farmers,” said Queensland Dairyfarmers’ Organisation President Brian Tessmann said. “Commodities around the world are rising – and so are farming costs – but milk prices are under unsustainable downward pressure from the retailers. “We know from a recent Senate Inquiry that the growing trend toward supermarket brand milk is putting a squeeze on the value chain and ultimately the farmer. This price drop will increase the price difference between large retailer ‘supermarket brand’ milk and milk processor branded milk. So of course shoppers will opt for supermarket brand milk and, with that, lower returns go to processors and that will flow on to the farm gate,” said Tessman. “It is kicking family farmers when they are down. This is happening at a time when the industry is battling the devastation of the massive Queensland floods. These floods are taking a heavy financial and emotional toll on farmers, and for Coles to give farmers this announcement on Australia Day is cruel and insensitive. We want our farmers to have confidence in the future and to be rebuilding their businesses after the flood. Coles Merchandise Director, John Durkan, said on the announcement of the price drop that the company would be responsible for the price discrepancy on the product. “In the same way that Coles is absorbing the higher costs of hormone growth promotant free beef, Coles is not reducing the price it pays to its milk processors either so this move will not impact them or the dairy farmers who supply them. In fact both farm gate milk prices and contract prices with processors recently increased,” he said. “With the floods we have seen dramatic prices increases in other food stuffs due to shortages, however milk is still the same price to consumers even though the cost of production for farmers has gone through the roof. Farmers cannot carry the entire burden we need to be supported as well and the market needs to reflect what is happening at farm level. Tessmann said the move underscored the urgent need for Federal politicians to review and implement the recommendations of the recent Senate Inquiry – released in mid-2010 but so far not acted upon – in order to stabilise the industry. I can understand how this is done – the use of permeate. 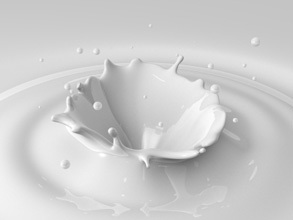 Many people do not know that some manufacturers add permeate, the filtered component of milk that has been concentrated for fat, to other milk in order to ‘water it down’. It is not natural and there is no requirement by FSANZ to label that permeate has been added. Some milks like a2 Milk do not add permeate and this makes them more expensive – plus of course the a2 beta casein guarantee! I wouldnt buy the cheap watered down milk from Coles and Woolies – besides they should stick to the retail market not the brand owning market. They combined have way too much influence on price and product range that limits consumer choice in this country. ACCC do something about it will you? Why is milk being used as a lost leader to create store traffic when degregulation and the takeover by foreign companies of the channels of dsitribution of 75% of our dairy industry has been allowed by the ACCC. It leaves our dairy industry seriously under pressure and farmers not being paid as much as it costs to produce. This has happened in an environment where Asian countries see dairy as a growth sector. The Chinese are buying our best bred heifffers from despartate Tasmanian farmers to send to Africa to breed and supply China – note Australia is not supplying them. Local real estate agents and ex Prime Ministers tout our farms for sale to the Chinese and Arabs. The Japanese already own 54% of the dairy industry here. Coles and Woolworths are “Johnny come lately” in eroding a key industry sector. Who will pay? Our farmers and ultimately Australians. These issues create a tipping point where are food security is seriously eroded and exacerbated by the recent natural disasters. When will we stand up for our producers instead of pretending everything is ok. Our businesses are not allowed to dominate key indsutry sectors but it is ok for foreign interests to do so. What a strange world we live in. IGA are the biggest rip off merchants ever but no one is ever game to say boo to them and I do not know why. Thank God for Coles and Wollies. They do not mind if Aldi reduces anything but never want Coles or Wollies to reduce any items then try to put over the story they are putting up prices. I think the ACCC is corrupt they way it sides with Aldi and IGA. No one is forcing anyone to buy any particular brand of milk.